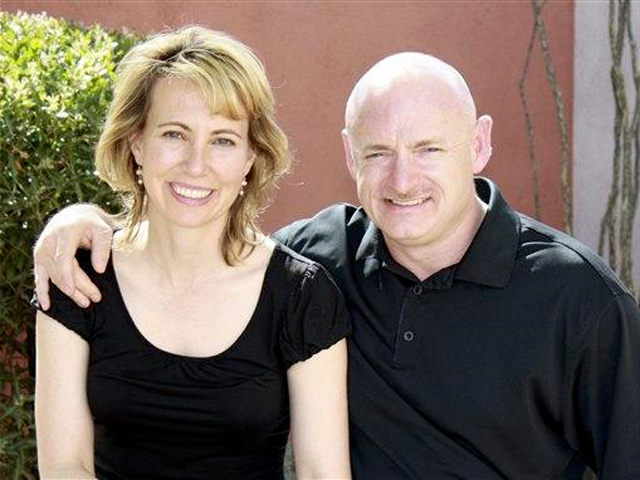 Five months after being shot in the head at an event with constituents in Tucson, Ariz., Congresswoman Gabrielle Giffords was at Cape Canaveral in Florida for the liftoff of space shuttle Endeavour on its final mission, with her husband, Capt. Mark Kelly, at the helm. And on "The Early Show" Monday, Giffords' chief of staff, Pia Carusone, said they changed their usual pre-launch routine this time. "Usually," Carusone told co-anchor Erica Hill, "he takes her wedding ring to space. So he took it from her a couple of days ago. But she wanted his. So, yesterday ... he gave her his ring. But his hands are a bit bigger than hers. So it didn't fit on her finger. So, he gave it to me to find a chain to give to her. So, I did last night. It's in my pocket and it will be around her neck as soon as I see her." "She'll be watching with the other spouses," Carusone added. "And with her will be her mom, and a nurse, which is just with her in case something happens. We don't expect anything would. But, that's it. Very small group. Kelly's twin brother, Scott will also be there, she continued, along with Mark's kids. Giffords, Carusone says, is stable medically, so the trip "is not challenging for her in that regard" but is "challenging from a rehab perspective. I mean, there's new terrain to move around on, new people to meet, new environments, and those are all things that the folks at (the rehab center in Houston) have told us is helpful for someone in her position. So, while it's a break from the hospital and the routine that she normally undergoes every day, it's still rehab, nonetheless."